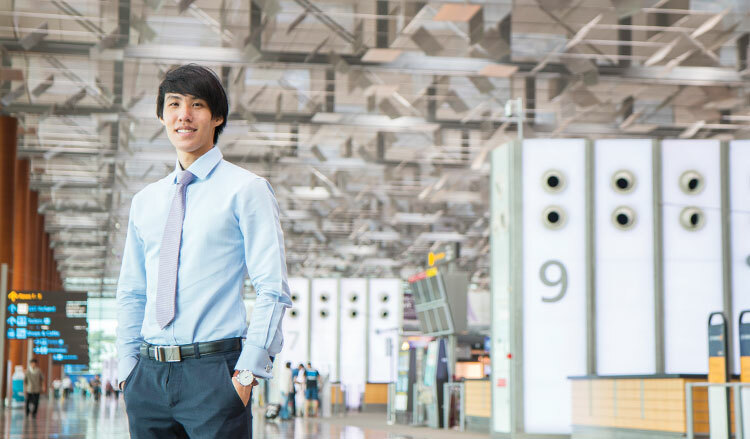 For Lucas Lee, the mere decision to take up an internship with Changi Airport Group (CAG) was the start of an eventful journey. His attraction towards the tourism industry motivated his internship application during his third year in the National University of Singapore (NUS). Imagine his joy when he was offered the mid-term scholarship at the end of his internship - no doubt after a thorough assessment of his personality and abilities at the scholarship assessment centre! Fast forward to today, and Lucas is part of the Terminal 4 (T4) Operational Readiness and Airport Transfer (ORAT) team under the Airport Operations Management division. His primary role is to oversee the transfer and boarding areas at T4 while working closely with airline partners. He works with these partners to conduct trials on new self-service initiatives and ensure that objectives are closely aligned. Lucas tells us, "CAG is just like the conductor of an orchestra, working with over 40,000 airport partners to deliver the best experience for our passengers. At times, it may feel like we are fighting an uphill battle in trying to align the interests of many different stakeholders. It always helps to take a step back and place oneself in the other party’s position. Addressing their concerns goes a long way in cultivating good relationships with our airport partners and working together towards a common goal." While Lucas' job at CAG is not devoid of challenges, it is also packed with memorable experiences. Lucas shares about two episodes that particularly stood out for him. The first was his involvement in the Singapore Airshow 2016 as a Liaison Officer, where he had the opportunity to attend conferences and catch the brilliant aerial displays up-close. The other was his participation in the organising committee for the Annual Airport Celebration 2016, an event which CAG hosts annually to express its appreciation to airport partners. Of his experience as an organising committee member, he shares, "It was memorable because I had the opportunity to work alongside many colleagues and made many friends throughout the process. Putting in many hours of hard work was worth it after seeing the guests’ happy faces at the event. Overall, I enjoyed myself greatly in the past year, and am certain that this year would bring even more interesting experiences!" As an airport group that is constantly redefining boundaries, CAG is paving the way for developments that will be the talk of the town. Lucas shares that some of these developments include T4, Jewel Changi Airport and Changi East Development. "The concept of travel is evolving day by day, and many airports have been stepping up their game in recent years. Changi Airport is no exception, and with all these new developments in the pipeline, I believe that we will continue to push our limits and deliver even more exciting and unique experiences for all our passengers passing through Changi Airport. These are exciting times indeed!" Lucas rounds off gleefully. Search BrightSparks for the CAG Scholarship and more!